Slides includes a number of preset font options but we also allow you to use custom fonts from Typekit, Google Fonts or even your own host. Follow these instructions to use a Typekit or Google font in your presentation. 3. Select which fonts to load in the popup. To load a kit from Typekit, simply enter your kit ID. If you want to use font families from Google Fonts we'll auto-complete the font name as you type. If you're loading Typekit fonts make sure that your kit is configured to allow loading from the slides.com and *.slides.com domains. 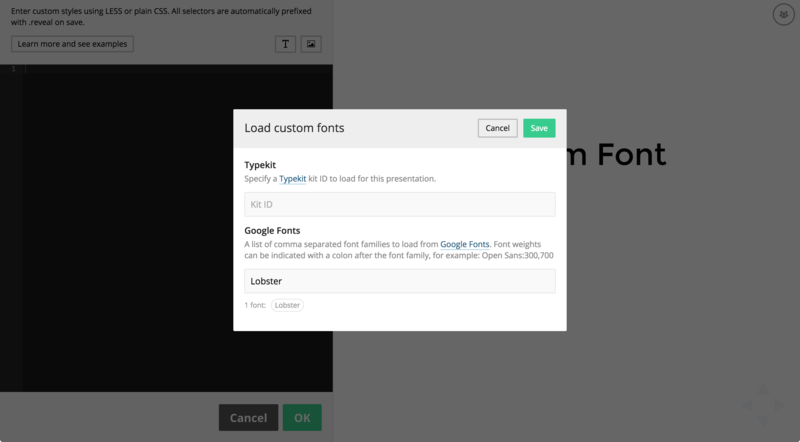 You can load custom font files directly from another domain. Externally hosted font files must be served securely via HTTPS protocol (i.e. https://...). Note that custom fonts are always loaded from a third party server and will not work when presenting offline from a ZIP or Dropbox export. They will work offline when exporting to PDF, though.